I’ve also been feeling I should offer you an apology for not posting in months. The challenges my health issues present me with on a day-to-day basis are on a “sliding scale,” such that given where my body is MS-wise directly effects how much energy/pain/focus I have in any given day. I keep wanting & meaning to post here, sometimes I even manage the skeleton of a draft of a post, and then I just don’t have it in me to finish. This blog – and all of your good company – means a lot to me. I don’t think you’ll ever really understand how much your comments & emails of support & encouragement uplift me. The mere Like-ing of a post makes me smile; it feels like a warm & welcome pat on the back. When you re-Tweet & re-Post on Facebook, I feel like I’ve been high-fived & Woohoo!-ed most enthusiastically. My world gets so “small” when I cannot get out in it, so this blog & social media become one of the few (vital) ways I have of connecting with others, of feeling a part of – instead of feeling alone, and separate from. You can read Bryan Ball’s excellent review of the 2014 ICE VTX here, on the review section of Bent Rider, including some very nice pics. If you want more VTX-ness – and, really, who doesn’t? – Travis Prebble of Recumbent Journal recently posted some eye-candy shots of the new VTX on RJ’s Facebook page. As always, I recommend Bent Rider as the best recumbent source of information I know. I especially love the forums, where you can meet other riders of two & three-wheeled recumbents, and learn just about everything there is to know about recumbent cycling. Especially helpful if you’ve just discovered three-wheelers and/or recumbents in general and want to know if one will work for your cycling needs. Then once you decide that, Yes! a recumbent is what you want, the next question is, Which one? Then you’re really gonna be glad that the Bent Rider folks are as nice & patient & eager to help as they are, so that you can ask as many questions as it takes to get you from the idea of a trike to the sweet, blessed reality of one. My trikin’ buddy Steve Greene has a fabulous Rider Stories section on his site, Trike Asylum, and he adds more tales of trikes & riders every day. (now there’s a blogger who never neglects his readers) He’s also got a lot of photos & rider feedback on a huge variety of trike makes & models, including the new ICE VTX. I really love reading about everybody’s trikes, all of the riders’ adventures, and most of all about people overcoming challenges great & small to get out there & RIDE. I’m happy when anybody gets out to ride, it’s just that being enabled to cycle translates into a universe of freedom, independence & confidence for those of us who struggle with our bodies & health issues. 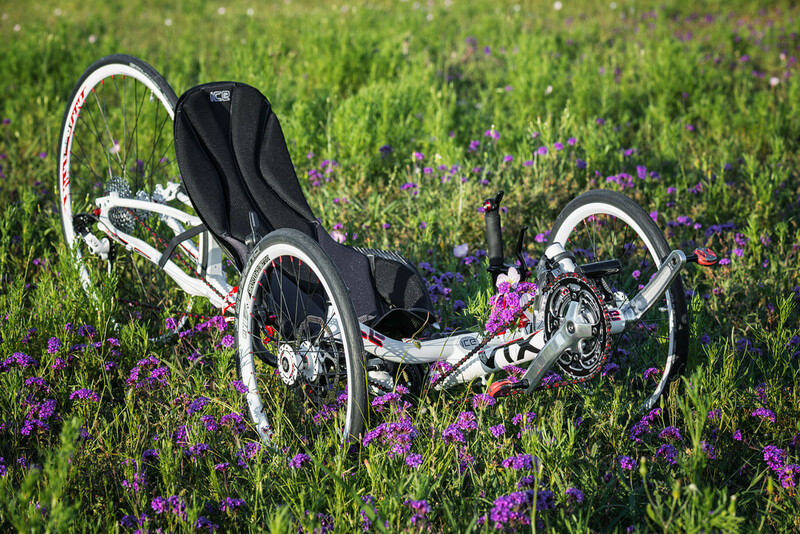 The discovery of recumbent trikes has transformed my life, and I want as many people as possible to experience that kind of revelation, that kind of world-made-new/body-made-whole-again feeling. 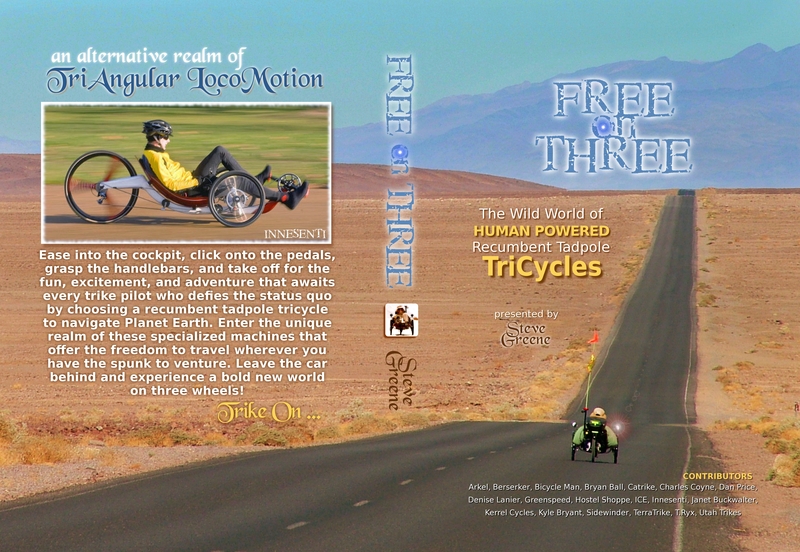 Steve does a lot to promote awareness of recumbent trikes & of cycling as a whole. He believes in 3-wheels not only as the perfect way to pedal, but also as the best way to navigate our world in general. A lot of cyclists care about cycling as a way to have fun, to commute, to travel, as a way to get & stay healthy (especially by way of adaptive cycling for people with health/disability issues). He believes passionately about leaving less of a “footprint” on our planet, and I’m not sure I can think of anybody who practices what they preach in that regard more than Steve. Heck, the guy doesn’t even own a car; he takes himself everywhere by pedal-power! If that’s not committed, I don’t know what is. Steve’s passion & commitment to pedaling inspires me, and I’m grateful for the information, support & encouragement he shares with others. 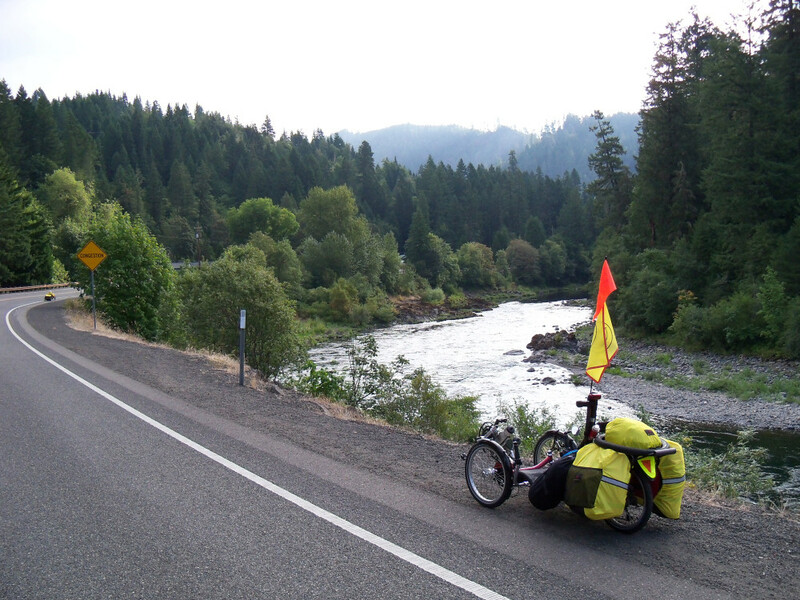 His blog was one of the first I found when looking for information on recumbent trikes, and he was incredibly helpful to getting me from someone who dreamed of riding again to actually on the road. There’s only one bad thing I can think of to say about the guy, and that’s he’s living my traveling-the-world-by-trike life! Okay, not such a bad thing – it’s not like he “stole” it from me. But still, I’m sooooo envious that pretty sure if you closely you’ll see a tinge of green to my skin. What I’d give to have a body with enough dependable health to attempt even one of the kind of cross-country trips Steve has gone on. just waiting for a time when we’ll get to ride together again – are you going to ‘attempt’ to be at the Possum Peddle in Gram, again this year? I want nothing more than to be able to ride with you & the Ride Ataxia gang very soon! Right now going to the grocery store is an ordeal. Some days I don’t even have it in me to get to the mailbox at the end of our driveway and back. So a road trip or a ride, much less a road trip AND a ride, are definitely not an option. Thanks for the shout-out, Denise! Thanks for the mention, Denise! Hi Travis, you’re very welcome! Well Denise, folks might come away thinking you’re on my payroll or something – of course, I have no payroll, as trike hobos prefer to be triangular wanderers without the shackles of capitalism and time weighing them down. I am humbled by your write-up, and when I get to thinking that a particular mountain is too steep to pedal, I remember you, your challenges, and think that, yes, I do have it easy in comparison. For humans, life is all about relative realities, and we all live our individual adventures, while also part of the unknowable power of life. Whatever our issues, we are all trike pilots, and share a bond that normal people will never know. Life on the edge is an awesome place to be, and you and I are there together! There soon will come another book of trike adventuring from the brain of yours truly, as I am in the final proofreading and editing stages. Also about to appear in the mix is a short movie that I believe will be enjoyable for the triking community. As you mention, trikes changed your life, and indeed, they have also changed mine! I love sharing the joy, just as you do. Trikes are freedom machines that liberate the body, and also the mind. The trike has been instrumental in allowing me to view this thing I call life in new and exciting ways. The trike is an outward visible extension of our inner ideological paradigms. Any way you look at it, trikers are mavericks! There are thoughts that I hold dear, and I believe express what lives in the head of you, me, and many other gypsies out there: Only those who risk going too far, will discover how far they can go! If you’re not living on the edge, you’re taking up too much space! That which does not kill you, makes you stronger! Believe, my friend … and RIDE!